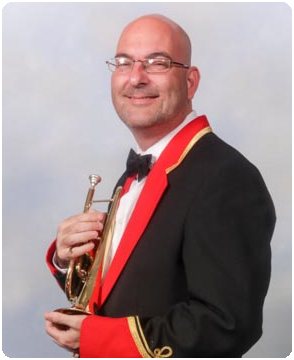 Andrew started to play Soprano Cornet with the St Dennis Youth Band in 1995. He was a member of the Cornwall Youth Brass Band for 9 years, occupying the Principal Soprano seat for the majority of that time. He received multiple awards at local contests for Best Cornet player/Best player in section. In 2007 Andrew was also invited to be a member of the European Youth Brass Band performing under the direction of Ian Porthouse and Major Peter Parkes. The Band played at many events as part of the European Championships including the end of contest Gala concert. Andrew has experienced a lot of success with the Senior Band over the years and takes pride in the fact that he was a member of the dedicated team that took St Dennis Band from the fourth section up to the Championship section, which took a mere 8 years to achieve. Andrew’s banding highlights include performing at the Symphony Hall Birmingham and the 2010 Pontins Contest where the Band were awarded 2nd place for their performance of Les Preludes. 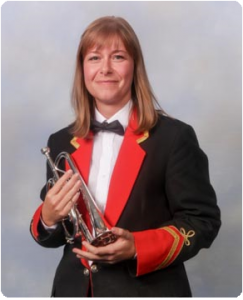 Catherine started playing the cornet at the age of 14 with the St Austell Youth Band and within 6 months played at the National Youth Brass Band Championships in the Royal Albert Hall. After progressing up through the Cornet section of the St Austell Youth and B Bands and having become a member of the Cornwall Youth Brass Band. In 1986 Catherine was promoted to the senior band where her brother Paul Richards was Principal Cornet. During her time with St Austell Catherine competed at many prestigious contests, including the National Finals, All England Masters, Grand Shield and received a Prince of Wales Medal for winning the Royal Trophy at Bugle for 3 consecutive years. In 1989 Catherine joined the St Dennis Band on Repiano Cornet and remained in that position until she left to have a family in 1996. After a 12 year break Catherine rejoined the band and now enjoys playing back-row cornet with her son James who is the 3rd generation of the family to play at St Dennis, as her father Rodney Richards was bands soprano cornet player for 27 years. Peter started his playing career at the age of 7 (1982) when he joined the Mount Charles Beginners Group taught by then member of the senior band, David Pope. After 12 months of playing he then progressed into the Mount Charles Youth Band where he started on 3rd Cornet and progressed through the ranks up onto Solo Cornet which he held until he left the band at the age of 18 Years. During his time in the Youth band he won contests with the band on several occasions including Bugle, Truro, Paignton and Prestatyn. He even featured on the first ever Youth band recording which even after all these years still sounds pretty good. In 1989 at the age of 14, he then progressed into the Mount Charles Senior band where he also started on 3rd Cornet but soon progressed up through the ranks to the Solo Cornet position and even spent some 4 Years on the Principal seat. To this day he believes that he is the only cornet player in Mount Charles Band that has played on every single seat in the cornet section (3rd, 2nd, Rep, Soprano, Solo Cornet and Principal Cornet). He even had a spell of about 3 Years playing in the Flugel position. 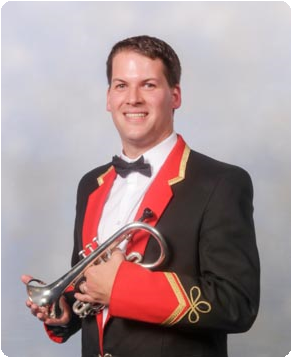 During his time in the senior band he has also won many contests including Bugle, Prestatyn and the Area Contest. His proudest moment was the first time that the band qualified for the National Finals and he had to walk out onto the very daunting Royal Albert Hall stage. Also during his time with Mount Charles he was known as the comedic magician performing at many Entertainment contests dressed as a Ballerina, Elvis Presley, a Jockey, as well as playing with his bells from time to time. In November 2010 he joined the St Dennis Band, with high hopes for the future and continued success and hopes that his presence, comedic timing, musical knowledge and playing ability will benefit the band immensely. Becki started playing at the age of 8 with the Camborne Youth Band. 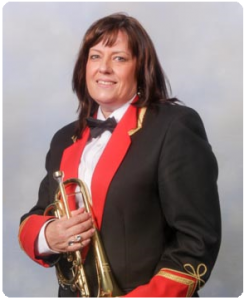 Since that time she has also played for Redruth, Lanner, St Austell, Camborne and Mount Charles bands. She joined the St Dennis Band in 2016. Becki works for the Economic Development and Culture Service, Cornwall Council.